Power BI On-Premises Data Gateway is a windows service (PBIEgwService) that moves data from on-premises to the cloud, and also is used by Power BI Report Server. The data gateway has been failing nearly daily. 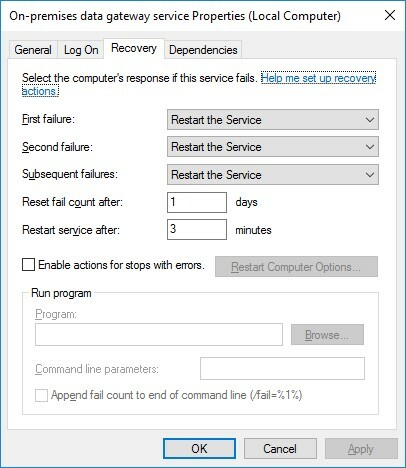 I’ve changed the service settings to restart upon failure with a 3 minute buffer. If this does not resolve the issue I might set up a heart-beat process that checks the health of the service and if it’s ever not running it will start it. There is a feature in Power BI which allows you to connect to your google analytics data, and there is a new preview feature which allows publishing content to the web in an iframe. In this post I have combined both features together to display my website statistics to the web. Note: PowerBI has trouble rendering in Chrome in some cases. If you are using Chrome and can not see the dashboard then try another browser. Hopefully Microsoft will resolve this problem. I’ve been catching myself up on what Microsoft is doing lately regarding Business Intelligence. After spending days reading Microsoft documentation and testing some various configurations of Power BI, Gateway,Azure, and SSRS, I came across this video that goes over some history and then gets right into Power BI and some competing tools. I suspect Microsoft is working toward merging Power BI and SSRS based on some of their SQL Server public previews.